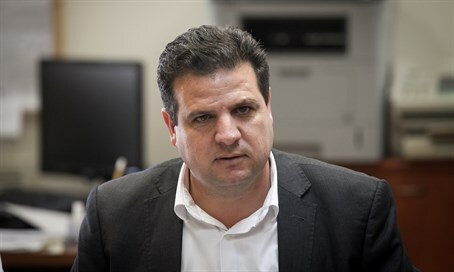 MK Ayman Odeh accuses MK Avi Dichter of sending people to "murder" the terrorist leaders of Hamas and the PA.
MK Ayman Odeh, head of the Arab Joint List party, on Monday claimed that there are Jewish Knesset members who “murdered Arabs with their own hands”. Odeh, who made the remarks in an interview on Channel 2 News after the Knesset's Constitution Committee approved a bill that would allow the Knesset to remove members with a majority of 90 votes, particularly pointed out MK Avi Dichter (Likud), who was in the past head of the Israel Security Agency (Shin Bet). "There is a hegemony that I cannot politically and morally accept – the hegemony which says that only people who promote the nationality law are legitimate,” Odeh argued, in reference to a law promoted by Dichter in the past which would enshrine Israel's status as the nation-state of the Jewish people. “No - they are extremists, and we will not accept it,” he continued, adding, “There are MKs who sent people to kill the leadership of the Palestinian people - Dichter sent people who killed [former Palestinian Authority chairman Yasser] Arafat, as well as well as [senior Hamas leaders] Ahmed Yassin and Rantissi, and he is in the Knesset. He sent people to murder other people." Odeh further argued that only the population that elected him should be permitted to remove him from office. It should be noted that the bill that would allow for the expulsion of MKs was put together after three MKs from Odeh's party visited with families of terrorists who murdered Israelis and later defended their actions.